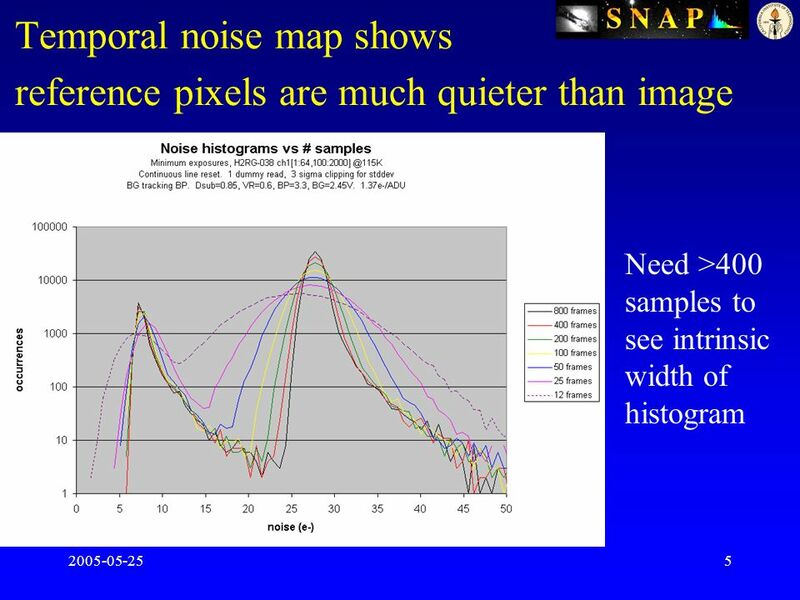 2005-05-251 HAWAII-2RG NOISE SNAP Collaboration Meeting M.Bonati, D.Guzman, R.Smith Caltech. 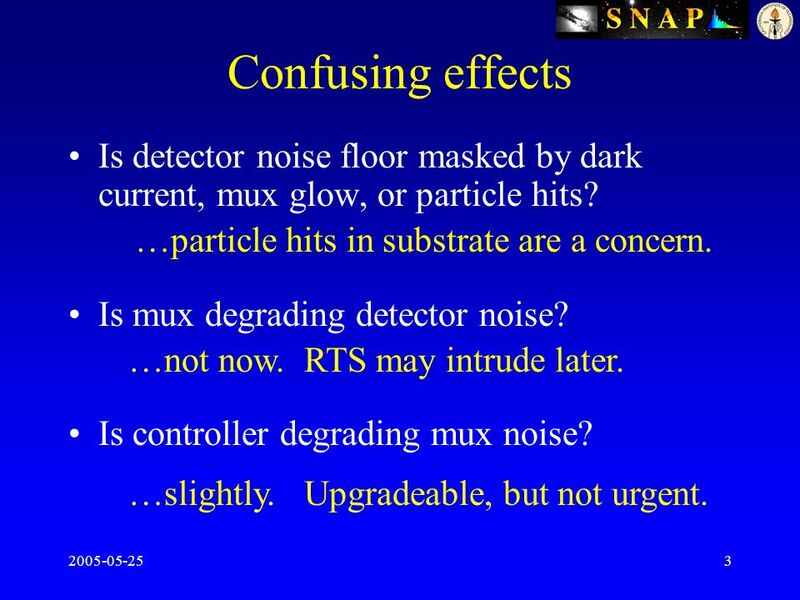 3 2005-05-253 Confusing effects Is detector noise floor masked by dark current, mux glow, or particle hits? 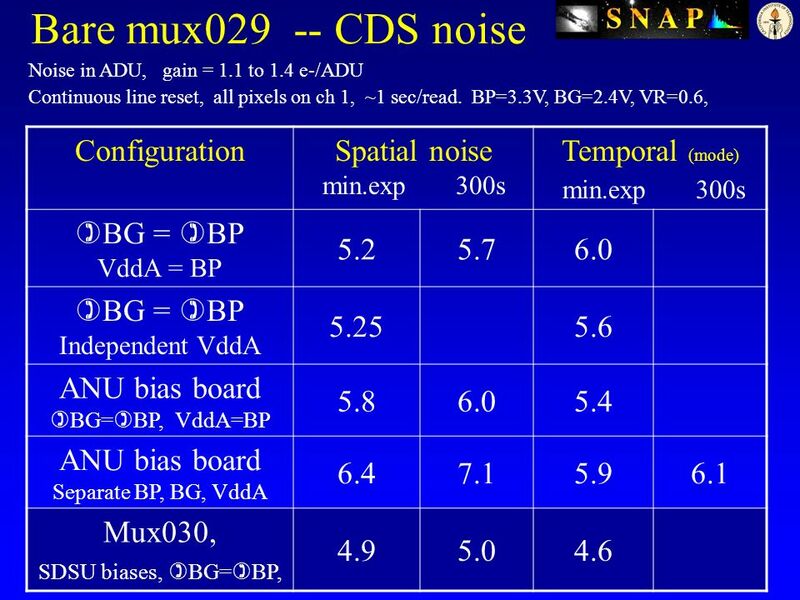 Is mux degrading detector noise? 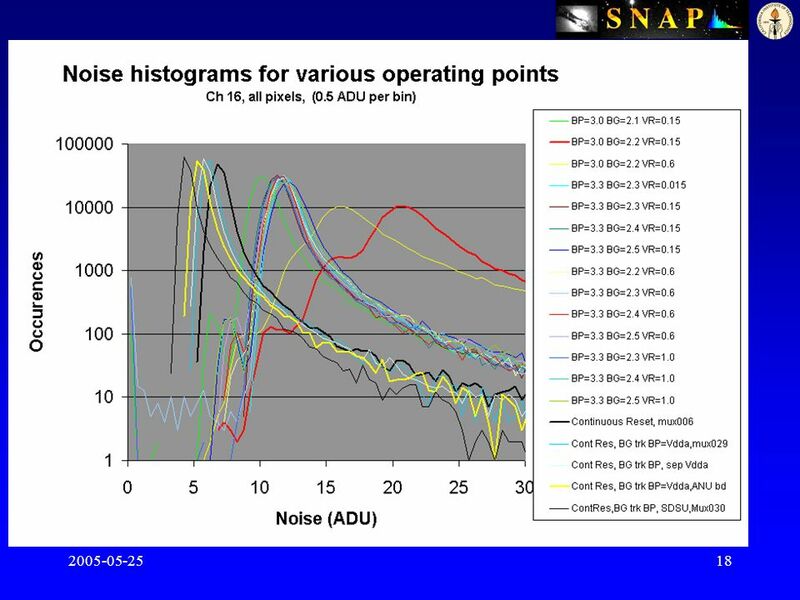 Is controller degrading mux noise? …slightly. Upgradeable, but not urgent. …not now. RTS may intrude later. 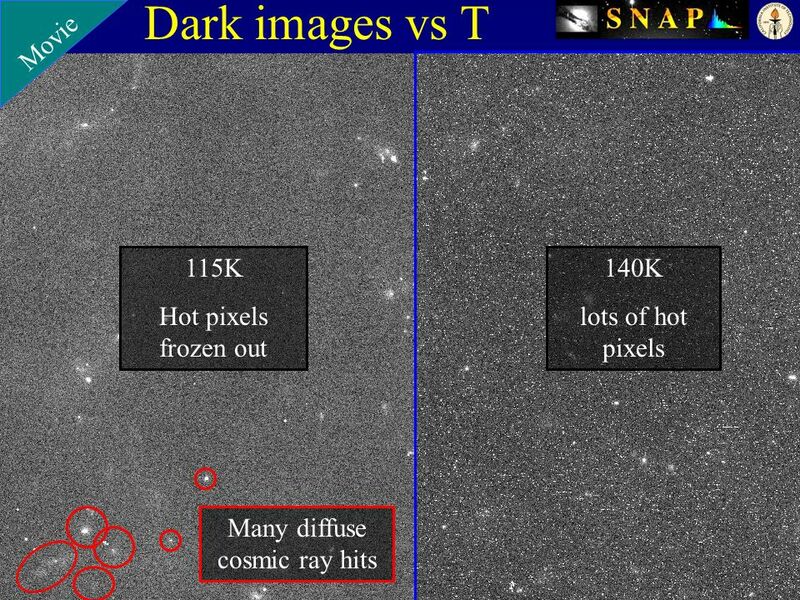 …particle hits in substrate are a concern. 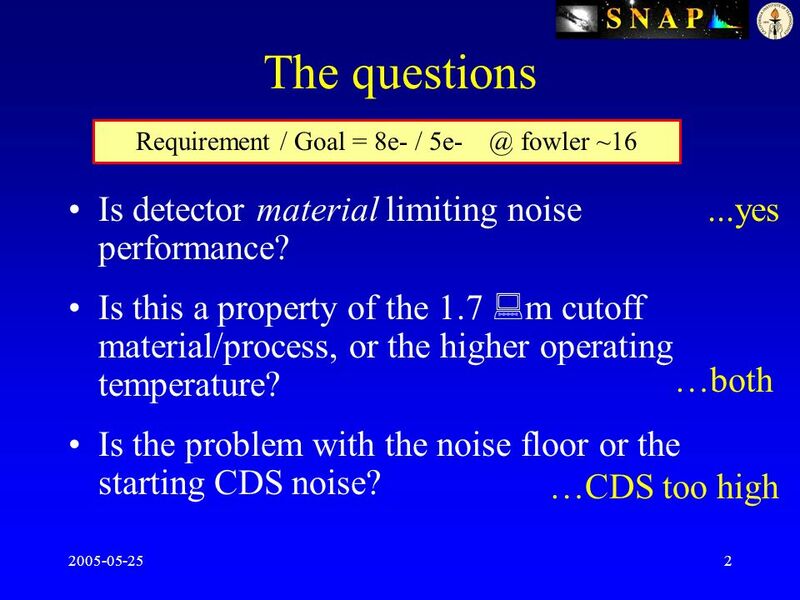 4 2005-05-254 How do we know detector material limits noise performance? 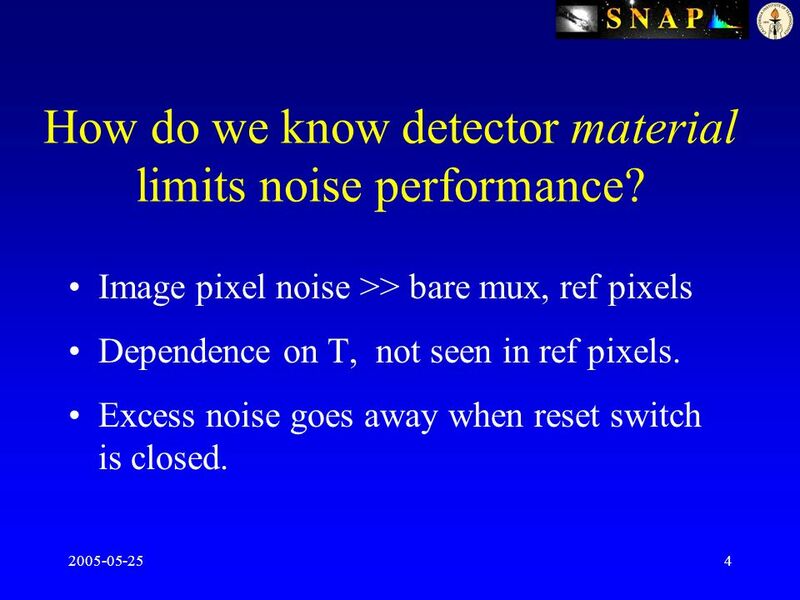 Image pixel noise >> bare mux, ref pixels Dependence on T, not seen in ref pixels. 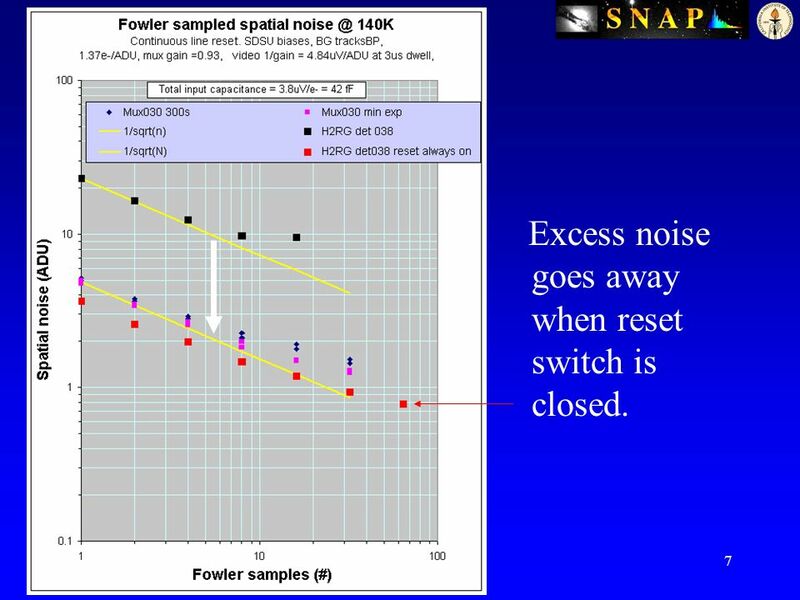 Excess noise goes away when reset switch is closed. 7 2005-05-257 Fowler Noise at 140K Excess noise goes away when reset switch is closed. 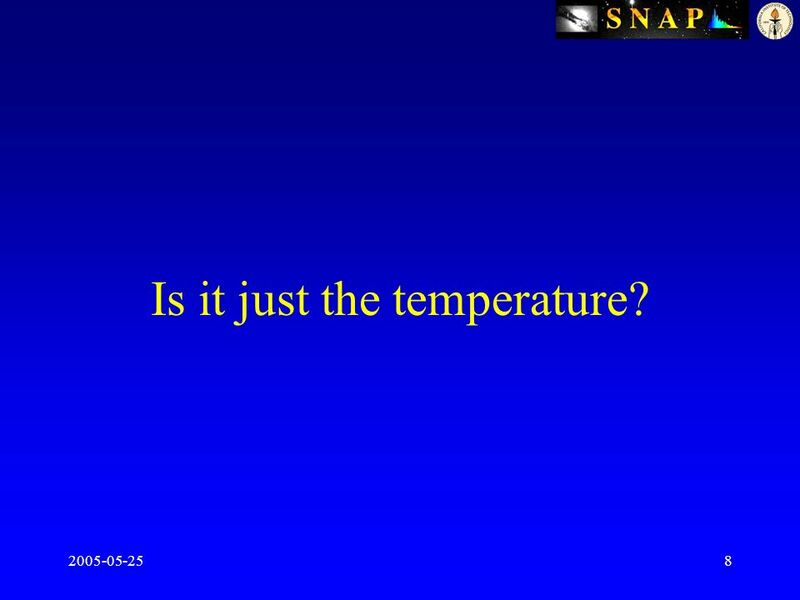 8 2005-05-258 Is it just the temperature? 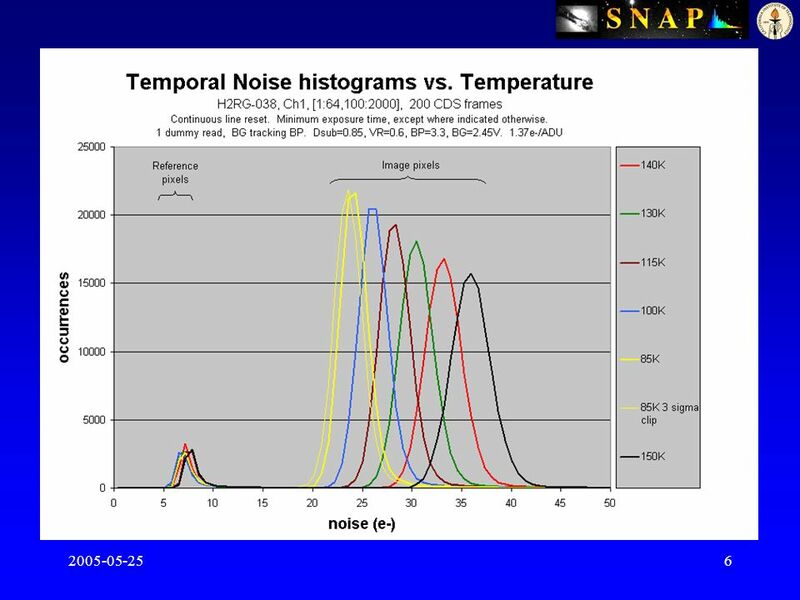 9 2005-05-259 At 77K CDS noise is still much higher than for 2.5 m HgCdTe. 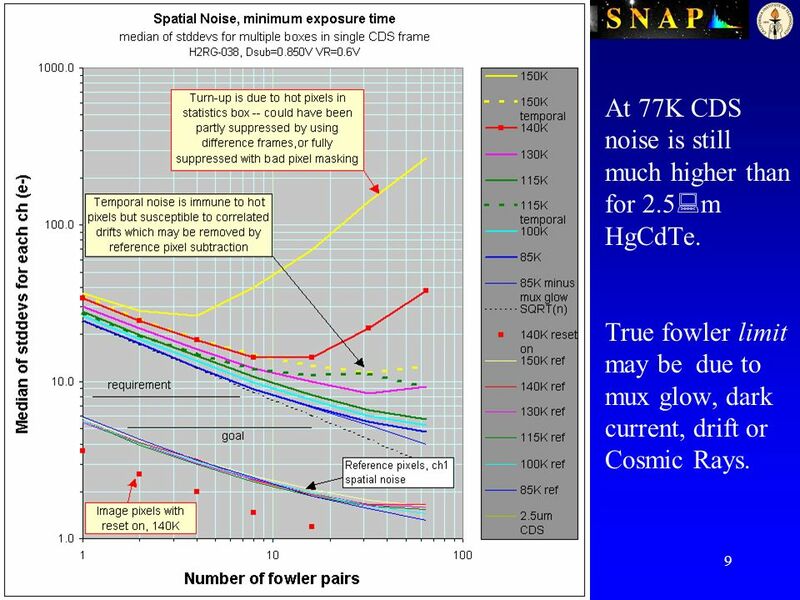 True fowler limit may be due to mux glow, dark current, drift or Cosmic Rays. 10 2005-05-2510 Dark current vs. 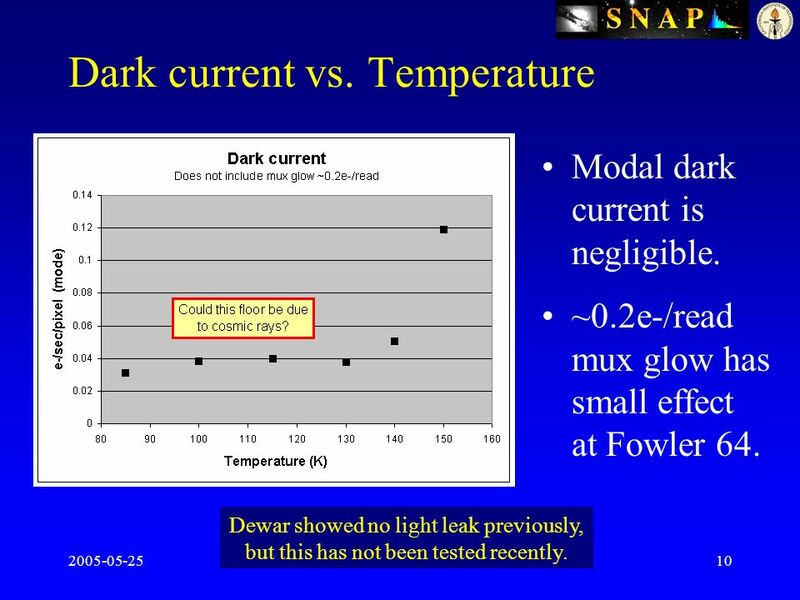 Temperature Modal dark current is negligible. ~0.2e-/read mux glow has small effect at Fowler 64. Dewar showed no light leak previously, but this has not been tested recently. 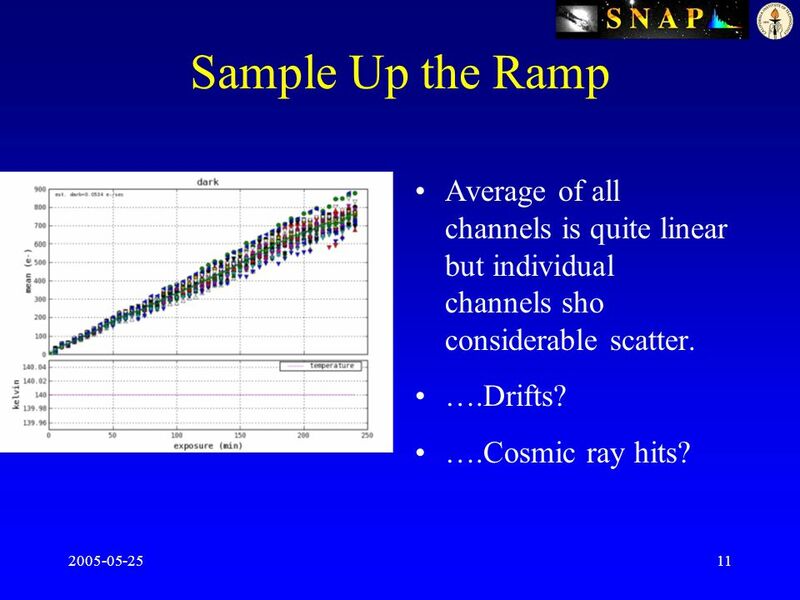 11 2005-05-2511 Sample Up the Ramp Average of all channels is quite linear but individual channels sho considerable scatter. ….Drifts? 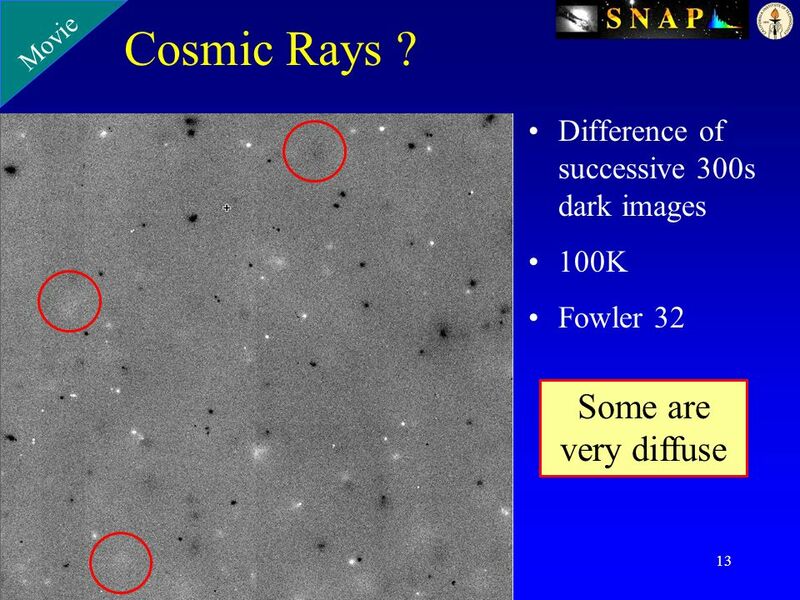 ….Cosmic ray hits? 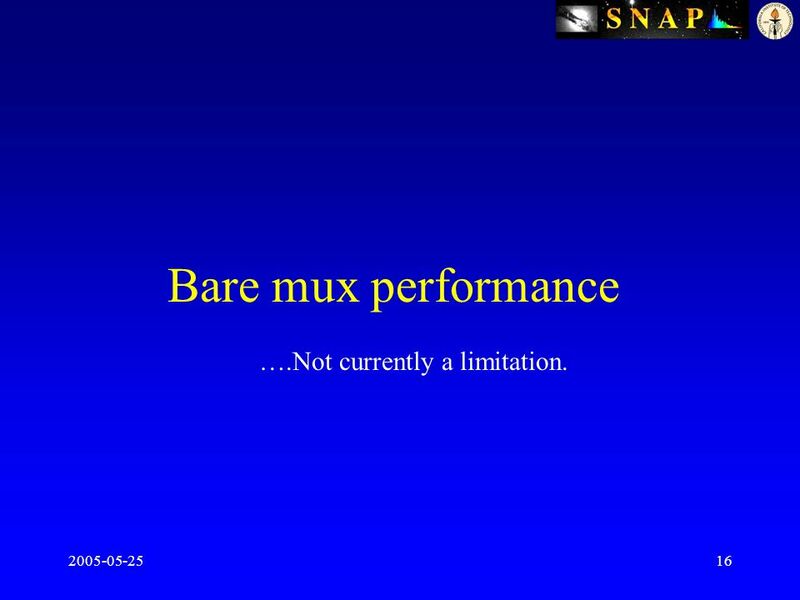 16 2005-05-2516 Bare mux performance ….Not currently a limitation. 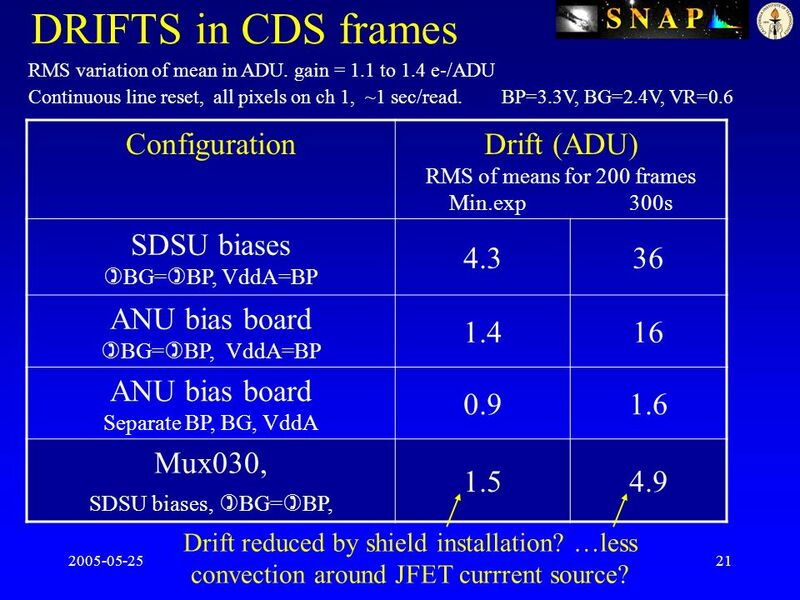 21 2005-05-2521 DRIFTS in CDS frames ConfigurationDrift (ADU) RMS of means for 200 frames Min.exp 300s SDSU biases BG= BP, VddA=BP 4.336 ANU bias board BG= BP, VddA=BP 1.416 ANU bias board Separate BP, BG, VddA 0.91.6 Mux030, SDSU biases, BG= BP, 1.54.9 RMS variation of mean in ADU. 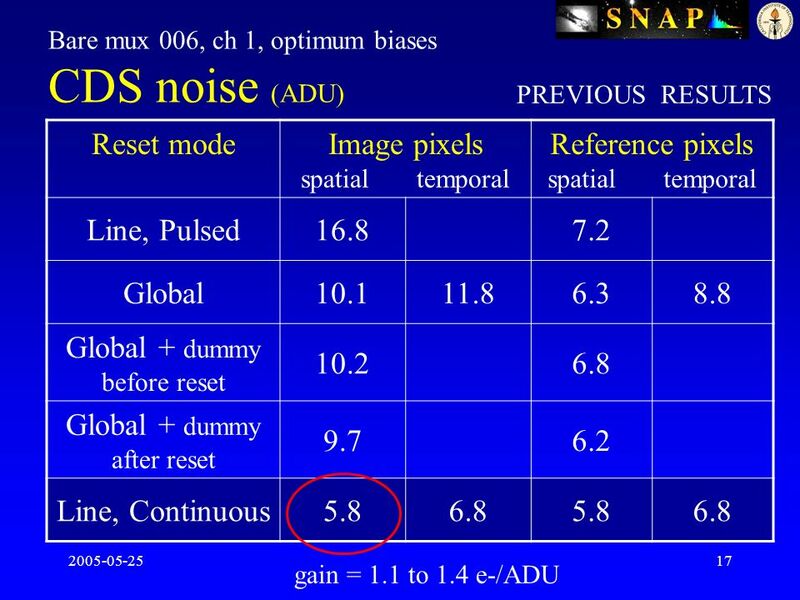 gain = 1.1 to 1.4 e-/ADU Continuous line reset, all pixels on ch 1, ~1 sec/read. 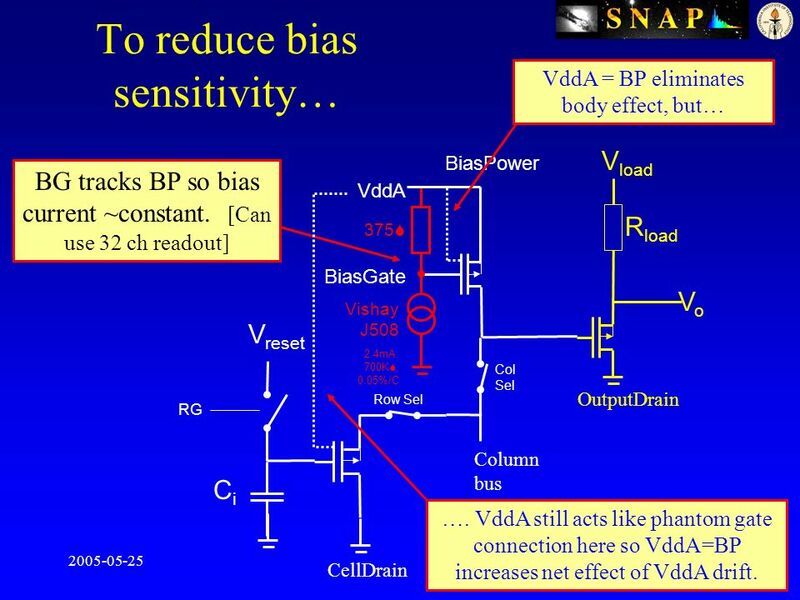 BP=3.3V, BG=2.4V, VR=0.6 Drift reduced by shield installation? 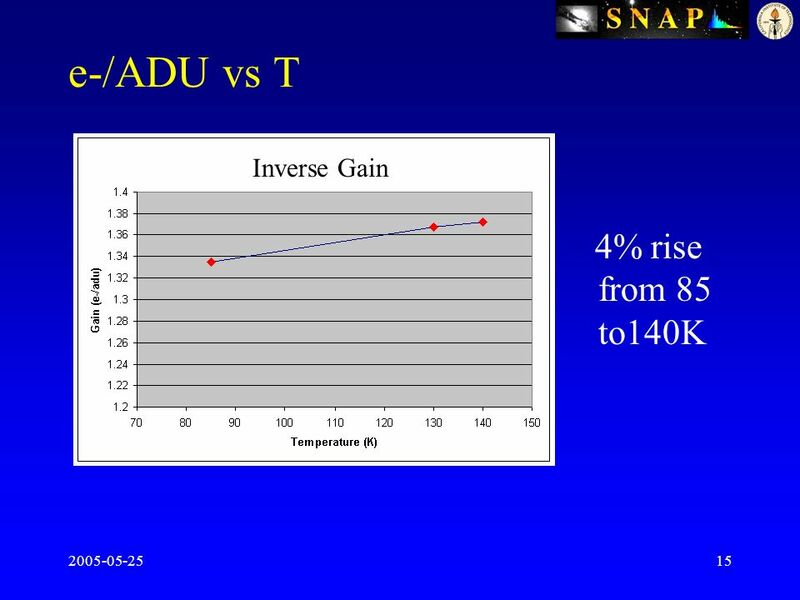 …less convection around JFET currrent source? 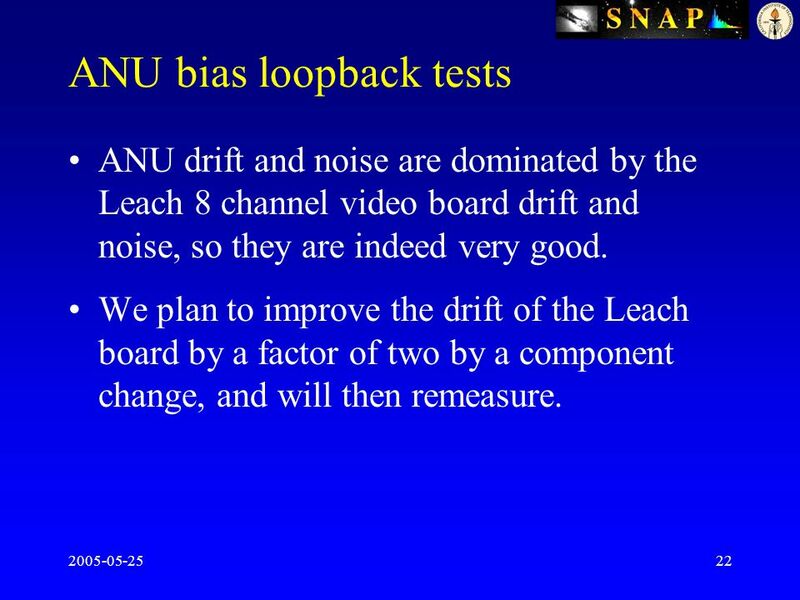 22 2005-05-2522 ANU bias loopback tests ANU drift and noise are dominated by the Leach 8 channel video board drift and noise, so they are indeed very good. We plan to improve the drift of the Leach board by a factor of two by a component change, and will then remeasure. 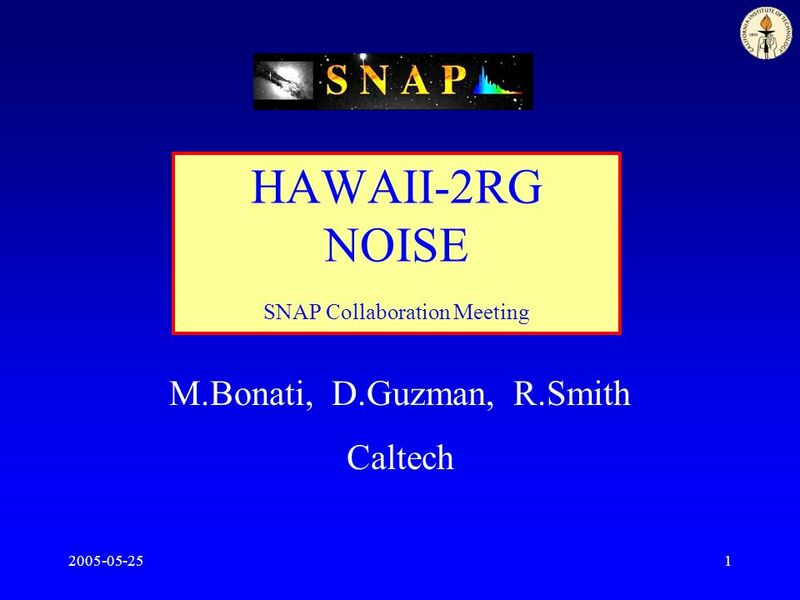 Download ppt "2005-05-251 HAWAII-2RG NOISE SNAP Collaboration Meeting M.Bonati, D.Guzman, R.Smith Caltech." / 251 Internet Applications Ahmed M. Zeki Sem – / Chapter 8. 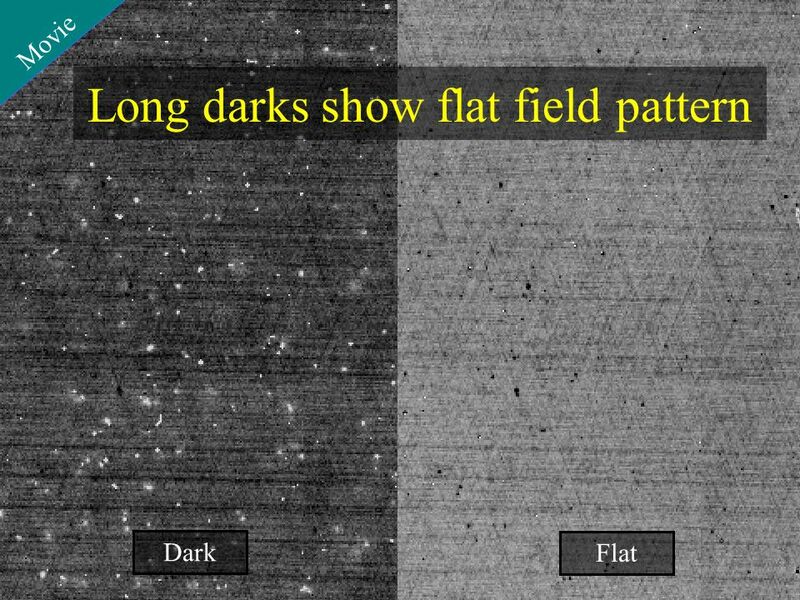 A 200 Frames per Second, 1-Megapixel, Frame Store CCD camera for X-ray imaging Dionisio Doering (a), Nord Andresen (a), Devis Contarato (a), Peter Denes. Good Loading Practices Carrier Transicold and PLM Trailer Leasing. CrIMSS EDR Performance Assessment and Tuning Alex Foo, Xialin Ma and Degui Gu Sept 11, 2012.